Marian Tompson has lived a life that has taken her on a passionate journey (if an unexpected one) and she continues to bring that passion to the organization she helped found. 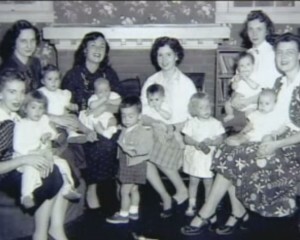 There is a growing collection of LLL lore—those favorite stories that get told again and again and make us appreciate just how far we’ve come in 60 years, thanks in great part to the initial efforts of those seven mothers who just wanted to help other mothers breastfeed their babies. The world in 1956 was quite different than today’s world, but the needs of the babies and the importance of mother support have not changed. For younger generations of mothers, it is hard to imagine a time when fathers weren’t allowed in the delivery room, or when most mothers weren’t even awake, let alone actively participating in the births of their babies. While some mothers wanted to breastfeed those babies, little was done to encourage or support that choice. Those that did, did so in spite of the times, not because of them! It was a time ripe for someone—or seven someones—to step up and fill the void. Marian’s life is an eclectic mix: child of the Great Depression, mother of seven, global ambassador of a fledgling breastfeeding support organization, during a time period when most women were either stay-at-home mothers or were working as teachers, secretaries, or factory workers. Even when she was speaking at a conference on the other side of the world, her heart—and her priority—was at home, about home, solidly connected to home. For Marian, life begins—and ends—at home, both figuratively and literally. “Home,” and all it entails, centers Marian. It inspires her and gives her life purpose. Few of us imagine what our lives really hold in store for us—as we look back at where we’ve come, the path that we imagined we might follow years before rarely has our footprints on it. And in the process of looking back, we might be surprised to see the path that our footprints did take. Choices, circumstances, historical events, and simple cases of being at the right place at the right time often define our life’s roadmap. And yet, what those choices and circumstances lead to has more to do with personality and dedication to cause than with random events creating detours in what we believed to be our charted path. 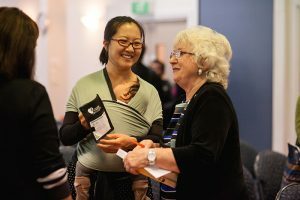 During the past 50 years, I can’t tell you how often a mother or father has come up to me at an LLL gathering and admitted that as a result of being in La Leche League, they were parenting their children so differently than they had originally expected to and so differently from the way they had been brought up. “I’ll kill myself if they don’t turn out” was a common refrain. We all want to do the best for our children. So what led me to make the kind of choices I did? First of all, I was influenced by the way I was raised and by the aunts and uncles who surrounded me. Then there were books that impressed me: Childbirth Without Fear and Cheaper by the Dozen. Though I didn’t realize it at the time, I think being fully “present” during a planned, unmedicated birth also had an influence. Birth is a holy moment, and I’ve even seen a father drastically change his expectation of the kind of parenting his newborn needed, just because he was present when his daughter was born. This particular man’s mother had worked throughout his childhood, and he just expected his wife would do the same. But being present at the birth of his first born buried that notion in his mind forever. A commitment to breastfeeding has another huge influence. All that skin-to-skin contact and closeness evokes a hormonal response that creates a different kind of bond between a mother and her baby. I remember telling Tom after Melanie was born that even if breastfeeding was no better than formula-feeding, I wanted to breastfeed all my babies because that closeness felt so good. It was the effect of my choices, along with the people those choices brought into my life, that supported and shaped my parenting. With our first three daughters born in less than three years, it seemed like I was always holding a baby or toddler, or both. Tom would leave in the morning while I sat in the rocking chair in the living room nursing the baby, with Melanie and Deborah playing on the floor beside me. As often as not, he would come home at the end of the day and walk in the door to see me rocking the baby, with the toddlers still close at hand. When the baby cried, I would pick her up. Much of my housework didn’t get done because the children came first, and I began to wonder if something was wrong with me. My neighbors, most of whom were bottle-feeding and living by the four-hour feeding schedule, seemed to be so much better organized. Their houses always looked neat and tidy. I secretly suspected it was a weakness in me that led me to carry my baby around because I couldn’t stand to let her cry. It took a while, but I finally came to believe that it was probably the effect of my birth and breastfeeding experiences that helped mold me into the kind of mother my babies needed. Few women breastfed at that time, and many were not even aware that it was an option. One day at the grocery store, Philip, who was only a few weeks old and lying in the cart, started to cry as one of my neighbors came down the aisle. “Oh, time for a bottle!” she said as she passed by. “Oh, no, he’s never had a bottle,” was my response. My neighbor skidded to a stop, turning her cart around to get back to me again. “You mean he’s drinking from a cup already?” she asked incredulously. That Philip might be breastfed never entered her mind. Babies were not usually taken out to public gatherings in those days, especially in the evening. It was expected they would be left at home with a babysitter and a bottle. Many times our baby was the only infant present when we attended talks about the family. The few baby carriers available in those days were usually slings designed to help support an older baby on his mother’s hip. But then I read a magazine article about a couple who wore their baby in a carrier on their back when hiking in the mountains. This was before carriers with metal frames were invented, so a baby had to be at least six months old before it could be used. But it seemed like such a great way to carry the baby, while having your hands free to hold on to other children. I wrote to the magazine, got in touch with the couple in the article, and discovered the Gerry Carrier, and voila! Mary White and I soon sent off for our own. We never did use them in the mountains, as Franklin Park is pretty flat, but they sure made it easier to take baby along, no matter what we were doing. Around this time, Mary told me about a lecture series on parenting being given by Dr. Herbert Ratner, the Health Commissioner of the city of Oak Park [and emeritus member of the LLLI professional advisory board]. The first one Tom and I attended covered the “terrible twos” and the “trusting threes.” Typically, the evening started with a film from Canada showing children of that age in real life situations. Then Dr. Ratner opened up the discussion to the parents. Everyone was welcome to ask questions. Dr. Ratner spoke about that particular developmental stage and gave suggestions on how to handle different kinds of situations that might arise. It was a perspective that resonated deeply with my own mothering style. Walking out of the auditorium, it was with a great sense of relief that I turned to Tom and said, “We have been doing the right thing after all!” How liberating it was to have Dr. Ratner’s validation! From then on, I could keep on picking up my babies, enjoy the toddlers, and ignore the dust bunnies under the couch and not feel guilty about it. Dr. Ratner also said something else that evening that further endeared him to me: “Show me a mother with a perfectly clean house and I’ll show you a woman with serious psychological problems.” Little did we know then that Dr. Ratner was not only to become an important person in our family’s life, but that his philosophy would later permeate the lives of thousands, probably millions, of families through La Leche League. Why was I in the bathroom nursing? Well, I had been sitting at a round table with six or seven doctors and was quite certain they would be very uncomfortable if I started nursing Philip in front of them. That would make me uncomfortable, too, and I just didn’t want to have to deal with it. 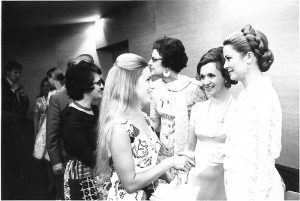 The next day at a breakout session, Betty Friedan went into more detail about why it was important for a woman to have a paycheck as a confirmation of her worth. So I stood up, Philip in my arms, and explained that just seeing Philip breastfeeding, happy, and healthy, and knowing how I contributed to this was all the justification I needed to feel important as a woman. With that, Ms. Friedan walked over to me, drew herself up, and said, “You are building up your self-esteem at the expense of your baby!” Imagine! I realized then that we were the product of two very different life experiences, and she might never understand why I enjoyed and valued being a mother. Thank you, Marian, Mary, Edwina, Betty, Mary Ann, Mary Ann, and Viola! Your simple wish to help mothers breastfeed their babies has provided support, companionship, and sound information for countless families and multiple generations—and hopefully many generations to come. Marian Tompson, mother, grandmother, and great-grandmother, is best known as one of the founders of La Leche League International, as well as an internationally renowned author, speaker, and tireless advocate for breastfeeding mothers and their babies. In 2001 she founded a second organization, AnotherLook, the only organization of its kind designed to foster research and discussion about HIV and AIDS as they relate to breastfeeding. She has been an inspiring and motivating speaker in more than 30 countries, touching the lives of mothers and babies throughout the world. Melissa Clark Vickers recently retired after nearly 28 years as an LLL Leader. She is the mother of two, grandmother of five, and helps edit the World Alliance for Breastfeeding Action (WABA) Mother Support for Breastfeeding newsletter. She also writes and edits for Family Voices, a non-profit organization dedicated to keeping families -especially those with children with special health care needs – at the center of health care. 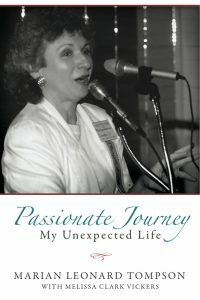 She was honored to help LLL Founder Marian Tompson write her memoir, Passionate Journey—My Unexpected Life . Melissa credits LLL for helping her parent according to her children’s needs, and sees that influence moving forward in how her own children parent their little ones.